Daily Illuminator: New Releases For June! April 2, 2013: New Releases For June! We have a pile of new things coming your way in June. 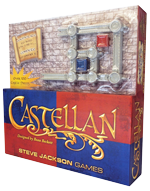 The long-awaited Castellan is making its debut, along with Munchkin Holiday Surprise, Munchkin Zombies Decay d6, and the Zombie Dice Score Pad! 108 detailed castle pieces, 28 cards, and rules. Stock #1906. UPC 837654321485. $34.95. We've created several holiday-themed Munchkin boosters over the years. Now you can get all those cards in a single set – that's 68 cards total, including four new ones created just for the Holiday Surprise! We've also included two new Christmas Munchkin dice and a special holiday Munchkin Kill-O-Meter to track your combat, because of course the holidays are all about bashing monsters and taking their stuff . . .
68 cards, two dice, a Kill-O-Meter, and a rulesheet. Stock #1488. UPC 837654321645. $19.95. 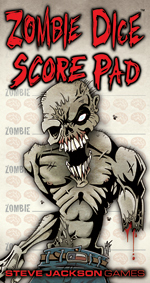 Munchkin Zombies Decay d6 features six custom six-sided acrylic dice previously available only in a limited release. Three of them are swirled pearlescent red with pus-yellow pips; three of them are swirled pearlescent ivory with blood-red pips, and all six feature a Munchkin head in place of the 1. You want them so you can kill the monsters and take their stuff! Six 6-sided dice and four Munchkin Zombies cards. Stock #5563. UPC 837654321843. $6.95. Keeping track of your brains has never been easier! 50 page score pad. Stock #5913. UPC 837654321829. $3.50.